There has been a lot of research and interest lately on the microbial environment in the gut and how it affects both physical and mental health. 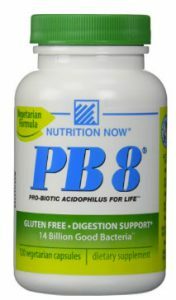 If you want to perform your best, and feel your best, at work and at home-you should consider taking a probiotic. When your gut microflora are in balance, your intestines are composed of many beneficial bacteria and yeast (microflora) that are believed to help make your immune system work well, enabling you to fight off viral and fungal infections and bacteria as well as allergens. Unfortunately, poor diet and exposure to toxins in the environment can wreak havoc on your gut flora. If you suffer from allergies, then it is believed that probiotics can help. People taking probiotics are also using it to maintain a healthy weight, get more energy and improve their overall well-being. Here are a list of supplements that we have tried and recommend for performance enhancement. We strongly recommend that you consult with your doctor to make sure you are able to take any of these supplements and let them know about any reactions that you might experience. Microcrylstalline cellulose, Lactobacillus acidophilus, Bifidobacterium lactis, Lactobacillus plantarum magnesium stearate, silica, Lactobacillus salivarius, Bifidobacterium bifidum, Bifidobacterium longum, Lactobacillus rhamnosus, Lactobacilllus casei. Ouwehand, Arthur, “Antiallergic effects of probiotics,” Journal of Nutrition, Mar 2007.